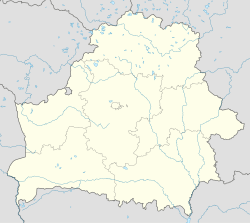 Minsk (Belaroushie: Мінск, pronounced [mʲinsk]; Roushie: Минск, [mʲinsk]) is the caipital an lairgest ceety in Belaroushie, situatit on the Svislach an Niamiha rivers. Minsk is a heidquarters o the Commonwalth o Unthirlt States (CUS) an aw. As the naitional caipital, Minsk haes a special admeenistrative status in Belaroushie an is the admeenistrative centre o Minsk voblast (province) an Minsk raion (destrict) an aw. It haes a population o 1,837,000 inhabitants (2009). The earliest references tae Minsk date tae the 11t century (1067), when it wis a provincial ceety athin the principality o Polotsk. In 1242, Minsk became a pairt o the Grand Duchy o Lithuanie, an it received its toun privileges in 1499. Frae 1569, it wis a caipital o the Minsk Voivodship in the Pols–Lithuanie Commonweel. It wis annexed bi Roushie in 1793, as a consequence o the Seicont Partition o Poland. Frae 1919–1991, Minsk wis the caipital o the Byeloroushie Soviet Socialist Republic. Wikimedia Commons haes media relatit tae Minsk. This page wis last eeditit on 23 Juin 2018, at 07:31.